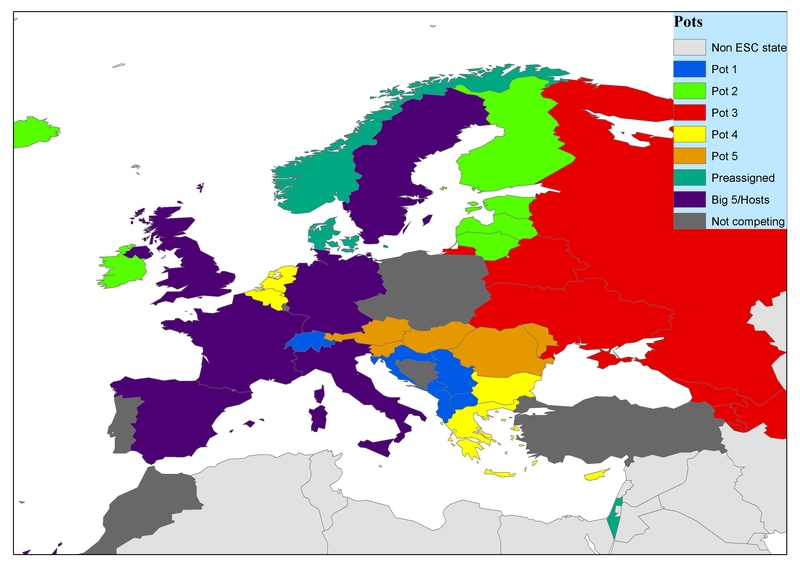 « Analysis of the draw for 2013 Eurovision semi finals. What countries does Ireland want to be drawn with or avoid? The draw for the 2013 Eurovision Song Contest semi finals took place today in Malmo in Sweden. In fairness, it’s hard to see how it could have gone much better for Ireland and what we got wasn’t too far off the dream draw outlined in yesterday’s post. Semi Final allocation: Dream: Denmark – Semi Final 1. Nightmare: Norway and Israel – Semi Final 2: Ireland got what Ireland was looking for here and will be performing in the first semi final along with Denmark on 14th May 2013. To makes things even better, the Irish act will be performing in the second half of that semi final. The remaining 15 contestants in both semi finals were drawn from a series of five different pots as noted in the previous post. Pot 1: The Balkan/post-Yugoslav Bloc pot – Dream: Switzerland, Croatia, Albania. Nightmare: FYR Macedonia, Serbia, Montenegro. Ireland got Croatia, Serbia and Montenegro. One of the more disappointing draws for Ireland as getting Switzerland and avoiding Serbia here would have been a major bonus. Against that, Croatia were one of the more likely countries to vote for Ireland in this pot and Montenegro have a weak qualification record. Pot 3: The post-Soviet Bloc pot – Dream: Azerbaijan, Russia, Armenia. Nightmare: Ukraine, Belarus*, Georgia. (though Belarus could probably be swapped with Russia or Armenia on the basis of qualification records). None of these countries have awarded Ireland much points in the past so in some ways it really didn’t matter who Ireland got in this pot, though avoiding some of the regularly qualifying countries (Azerbaijan, Russia, Ukraine) might have been a bonus. In the end, Ireland got Russia, Belarus and Ukraine. Belarus has by far the weakest qualification record of the countries in this pot, but Russia and Ukraine are almost virtual certainties to qualify based on their past record. The Ukraine entry is also likely to figure among the more likely contenders to win Eurovision this year. Pot 4: The Diaspora pot – Dream: Malta, Belgium, Netherlands. Nightmare: Bulgaria, Cyprus, Greece. We effectively wanted to get at least two out of Malta, Belgium and The Netherlands in this pot and to avoid Greece especially and this is what we got, drawing Belgium, The Netherlands and Cyprus. None of these countries have very strong semi final qualification records and we would be hopeful of a good Irish act winning some points off of Belgium and The Netherlands. Avoiding Greece, with its perfect semi-final qualification record, is a further bonus. Pot 5: The Central European pot – Dream: Hungary, San Marino, Austria. Nightmare: Romania, Slovenia, Moldova. Avoiding Romania and Moldova here would have been a significant bonus (very few points given to Irish entries, strong semi-final qualification records) – as it transpired we missed out on Romania but not on Moldova and we find ourselves in the same semi final as Austria, Slovenia and Moldova. Moldova is the bad news story here (Moldovan acts usually qualify for the Final, so long as they don’t sing to their teddy bears) but we would be hopeful of winning points off Slovenia and especially Austria and neither of these countries have strong qualification records. It is worth noting that the inclusion of Slovenia in this semi final means four of the Former Yugoslav states are in this semi final and only one in Semi Final 2. The Big 5/Host countries – Dream: United Kingdom, Sweden, Germany. Nightmare: Spain, France, Italy. The main thing here was to have the United Kingdom drawn to vote in the Irish semi final and the good news is that this is what happened, as The United Kingdom, Sweden and Italy will all be voting in Semi Final 1. Getting the United Kingdom is excellent news for Ireland but to also get Sweden is an additional welcome bonus. The only dark cloud here was getting Italy, a country that has yet to award one Eurovision point to Ireland since returning to the contest in 2011 after a fourteen year break, but maybe it is just the case that the Italians don’t like Jedward… In fairness the Italians have only got an opportunity to vote for one Irish act over the 1998-2012 period so maybe “more conventional” Irish fare might wangle some points away from Rome??? So on the law of averages and the “you can’t always get what you want” rule, it has to be said that this was a pretty good draw, all in all, for Ireland. A good Irish act really has no reason not to expect not to qualify from a semi final draw such as this. This entry was posted on January 17, 2013 at 10:45 pm and is filed under Eurovision, Eurovision politics?. You can follow any responses to this entry through the RSS 2.0 feed. You can leave a response, or trackback from your own site. Great analysis of the draw, I agree with all really except your point on Switzerland. The Swiss entry this year is very strong and should qualify for the Final with ease (not specifically my taste in music, but I recognise that it will be successful). It’s up to the Irish now themselves….send a decent song and should make the Final. The reason I wanted Switzerland in our semi final hadn’t anything to do with the song quality, but with the fact that the Swiss were much much more likely to vote for an Irish act than any of the countries in that Balkan/post-Yugoslav pot! I understood that, but on balance it is better to avoid a strong contender in the semis as a strong Swiss entry would undoubtedly garner huge points from those western European countries that would be favourable in the past in terms of voting for Ireland and with countries with as strong a record of qualification such as Ukraine and Russia (will qualify no matter what they send) then we want as little strong west European entries as possible in our semi. Obviously I’m using the term western European loosely. But your analysis is great, makes a lot of sense. Off topic comment here, but if Malta choose to send Kevin Borg’s entry to Eurovision, I’m convinced it will win. He will have huge appeal as will the song across vast swathes of Europe and the fact he won Swedish pop idol in 2013 means he will be very popular across the Nordic countries too. And he’ll probably receive more attention as the host country know him well and will perhaps generate a lot of hype….plus it is a very good song, it is the sort of song that will win points across all age groups. Reminds you of a song that X-factor winners release after winning the title.